After 17 years in the health and fitness industry, Kevin’s passion has been and continues to be movement. In order to improve one’s movement there are three main goals that each and everybody should try to reach. Mobility is the amount of useable motion that one has and the more mobile one is the more they are able to potentially move safely, efficiently, and effectively. Joint strength tends to decrease with age but can be improved with the proper techniques. Lastly, being able to control your body is largely dependent on your nervous system and also can be taught. These are the foundations of movement and what Kevin does and teaches on a daily basis. Beyond that, body weight movements make up a bulk of what he believes in. There is no better way to strengthen the upper body and core than using gymnastics rings. They can be used for beginners all the way up to Olympic athletes. Pound for pound gymnasts are some of the strongest people in the world and they just move their bodies around all day. In order to develop the lower body, body weight exercises may be a starting point but then eventually progressing to external load including dumbbells, barbells, and kettle bells. Kevin also loves to get back to the basics and teach his students how to crawl, walk, run, balance, jump, climb, catch, throw, lift, and carry as all of that applies to daily life. Most of all he likes to have fun and make “working out” as playful as possible. Living a holistic lifestyle is the cornerstone to his approach. If you’re eating the wrong foods, not getting enough sleep, have too much stress, etc., it might pose a challenge in trying to reach your fitness goals. Kevin has successfully taught hundreds of people how to make better choices and in doing so has made many improvements including, but not limited to, blood pressure, heart rate, energy, digestion, and helped developed an anti-inflammatory way of eating. Whether it's trying to shed a few pounds, gain some muscle, learn a new skill (i.e. 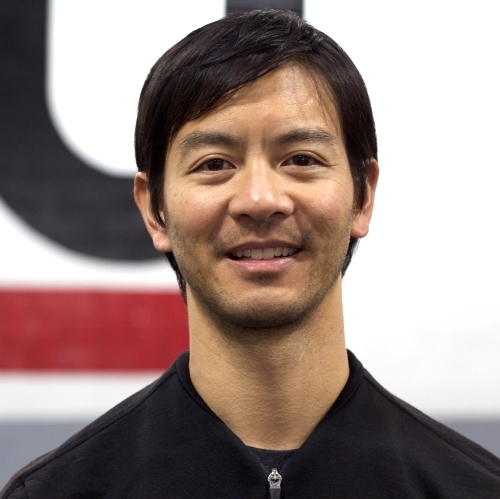 handstand, cartwheel, tumbling), or simply move better pain-free, Kevin has a plan that will help you achieve that goal. "I trained with Kevin for over two years. I was already very familiar with strength training and had worked out regularly for years, but I was recovering from intense back problems and a recent surgery. Kevin taught me a whole new approach to my workouts and nutrition. We focused on the full body and functional movements that always concentrated on core stability. Over the course of the two years he kept me challenged and continuously progressing with more advanced and new movements. Kevin motivated me past my comfort zones, through a calm and positive encouragement. Kevin helped me achieve my fitness goals. I truly was in the best shape of my life. Kevin is highly informed about the body and movement. I enjoyed hearing about his continued efforts to push himself and learn new ways to maximize his body's potential. He is also one of the genuinely people I ever worked with. He was flexible in working around my schedule and interested in my well being as a while person. He would regularly check in on me when I was under work stress. I would highly recommend Kevin for anyone seeking an informed and thoughtful trainer at any level. Kevin is of the highest professional grade and I continuo to reap the benefits of the knowledge he shared and the skills he developed" - Kevin R.
"Wow. Where do I start? Kevin Moy was fantastic. He has been my trainer for 2+ years. He helped me with a combination of nutrition input, strength training and cardio. I lost 25 lbs in the first year, improved my upper body strength and then kept the weight off. Lots of trainers can show you how to work out. What separates Kevin from the rest is his ability to motivate you and educate you so that you really want to do your best. Kevin also helped me with specific routines to help get my body in shape for golf. I would recommend Kevin to anybody.” - Paul J. "Kevin has been my trainer for over two years. I had been with another more "traditional" trainer prior to that and while that worked well for me for a while, once I started working with Kevin I really started seeing results. Kevin's method, at least with me, concentrates more on natural movements (when was the last time you crawled?! It's harder than it seems! ), flexibility, balance, and toning. He utilizes all sorts of props - from bands, to kettle bells, to weights, to straps, to your own body, and more - which always keeps things interesting. He's always very present when he's with you--doesn't spend time looking around at what's going on around him - he's concentrating on you the whole time. He provides input about diet and general health as it pertains to his understanding of your own situation and is always ready to research information he thinks may be beneficial to you.” - Michelle J. "I trained with Kevin for over 5 years. He is great -- so great that I got out of bed at 530am three times a week to make it to our workouts! Our training was full body with a focus on functional movements -- the movements that really matter day to day. He also is super knowledgeable about nutrition and was able to give me tips about eating better and cleaner. If you train with Kevin, you'll quickly learn that he is passionate about training -- it is not just something he is doing part time. He regularly attends workshops, seminars and classes to learn new techniques and we incorporated many of these into our workouts to keep them fun and challenging. He is also extremely accommodating about rescheduling workouts -- I really appreciated this since I work in a profession where my schedule can be unpredictable. I highly recommended him.” - Mikaal S.